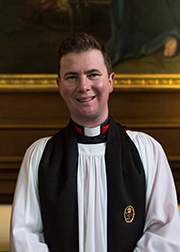 Clare’s Dean and Director of Studies in Theology, The Revd Dr Jamie Hawkey, has been appointed by the Crown as Canon Theologian of Westminster Abbey. He will have a particular responsibility for theological study and teaching, and will become a member of the steering group for the Westminster Abbey Institute. He will also be a Visiting Lecturer at King’s College London. He will leave Clare in December 2018. In addition to his work as Dean of Clare, Jamie has also been co-convenor of the MPhil in Anglican Studies and has taught undergraduates and graduate students for both the Divinity Faculty and Theological Federation. He is currently a member of the International Reformed/Anglican Dialogue, and of the Malines Conversations Group. His commentary on the latest agreed statement of the Anglican/Roman Catholic International Commission will be published by SPCK later this year, and he is currently working on The Heart and Heat of Pentecost: Renewing Anglican Ecclesiology. He recently represented the Anglican Communion at the 8th International Conference of Orthodox Theology in Thessaloniki, and gave the 2018 Lyttleton Lectures at Eton College on Church and State. Clare’s former Dean, the Revd Dr Nicholas Sagovsky, was also Canon Theologian of Westminster Abbey between 2004-2011.